Is massage safe if I have cancer or I am recovering from cancer? 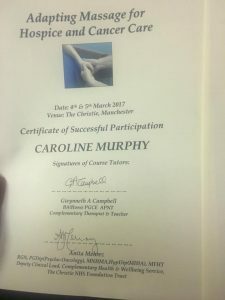 We trained with Christies and are so pleased to be able to deliver effective massage to the highest of standards to those that have cancer and those who are recovering and have recovered. Lets end the taboo around cancer and massage. You can have a massage as long as the therapist is trained. Massage is considered a type of complementary therapy. Complementary therapies aim to treat the whole person, not just the symptoms of disease. They are used together with conventional or mainstream medicine. Why do people with cancer use massage ? Research shows that massage of muscles and soft tissue does not spread cancer cells. Light, relaxing massage can safely be given to people at all stages of cancer.